Back to Kpreps this fall, our contributors will hand out helmet stickers to a team or individual that delivered the most important performance of the week in their opinion. 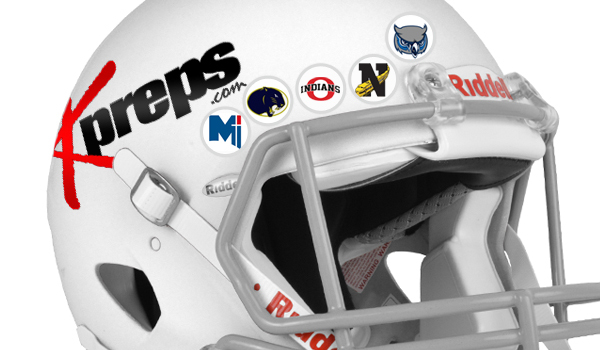 Check back each week to see that week’s helmet stickers, and follow @Kpreps on Twitter and Facebook to watch as the Kpreps helmet fills up with stickers as the season goes on. One of the top trends for the 2018 high school football season is the number of marquee matchups that have either never occurred or happened on an extremely infrequent basis. These contests have helped shape the first half of the year, including Olpe/Jackson Heights, Victoria/Clifton-Clyde and Southeast of Saline/Rossville. Arguably the most anticipated matchup occurred last week when Miege played host to Rockhurst (Mo.) for the first time since 1986. The contest had an estimated 8,500 fans, a crowd that would more than sell out multiple college stadiums in the state. Miege fell 14-13 and had its 29-game winning streak end. The Stags pulled within a point midway through the fourth quarter, and coach Jon Holmes wanted to go for the win on the two-point conversion. Miege caught Rockhurst off guard, and the Hawklets had just nine players on the field. Rockhurst stopped the Stags for a great play in a thrilling contest. Kudos to Miege and Rockhurst for reigniting a matchup, a contest that would be a great yearly game and hopefully does continue. Also credit for coach Holmes and his staff for trying the conversion. Sometimes the play doesn’t work, but it was nice to see a team go for the possible win against such a big rival. Since ’04, Rockhurst is 9-1 against Kansas schools, including a win against Blue Valley two weeks ago. The only loss was a 55-27 defeat to Hutchinson in ’09. The Salthawks won the state title that year. Additionally, Miege, with matchups with Blue Valley and Aquinas in the next two weeks, has permitted just 49 points this season, fourth-best in 4A. The Stags are on pace for a better scoring defense than the previous four years, all that ended in 4A-I championships. Newton trailed Hutchinson, 35-21, at halftime last Friday. The Railers, though, made some key second-half adjustments, had another big performance from dual-threat quarterback Colton Davis, and came back for a 42-35 victory. After the break, Newton shifted the defensive line’s alignment and brought another linebacker onto the field, which helped give the Railers some confidence and lead to the key milestone victory. Newton limited the Salthawks to 35 total yards in the second half. Third-year coach Chris Jaax said it marked the first time Newton had defeated Hutchinson since ’97 and noted to his captains that none of the players were alive for the last win. (Newton did beat the Salthawks in ’99, though Jax said the Railers had to forfeit the victory). Davis hurt his knee at the end of the third quarter but still posted 375 yards of total offense and six scores. With around three minutes left, Newton faced a fourth down with more than 10 yards to go. The Railers had fumbled their last two drives inside Hutchinson territory. Newton was going to kick a field goal, but Davis, known for his leadership, said he wanted to run a play. Davis went to a secondary option in the middle of the play, threw a completed pass and Newton converted the first down. Offensively, lineman Ethan Entz is a three-year starter. Defensively, Jaax calls senior linebacker Matt Seirer the heart and soul of the defense, while senior defensive backs Zach Garcia and Jerik Ochoa are key stalwarts with a physical, aggressive nature. Newton returned several players from injury, notably offensive lineman Brett Ashcraft and senior running back Jamieson Jones, though missed two receiving threats versus Hutchinson. Jaax, a former Bishop Carroll assistant, is in his third year as Newton’s head coach. He went 1-8 his first fall, 3-6 last year and 2-3 in 2018. Newton has not been at least .500 since a 5-5 mark in 2013 and had a winning season since a 7-3 record in ’09. My sticker goes to Coach T. J. O’Neill and the Olathe West Owls for picking up the first varsity win in school history with a 40-14 decision over Shawnee Mission West. This is the Owls’ inaugural season for varsity football after playing a JV schedule a year ago. Senior quarterback Zac Krause passed for 191 yards, threw three touchdown passes, and was on the receiving end of another touchdown pass from Alex Birge. James Frazier-Baker caught nine passes for 90 yards and two scores, while Jackson Novacek also had a touchdown catch. Sophomore Reggie Dennis rushed for 124 yards and a score and Gavan McDaniel added 99 yards and a score on the ground. Olathe West has been building towards this monumental victory for a few weeks. After losses to Lawrence Free State and Gardner-Edgerton, Olathe West fell by 10 points to Olathe East in Week 3. The Owls almost broke into the win column in Week 4, but Shawnee Mission North scored late to top Olathe West, 35-34. Olathe West will look for consecutive wins as they host KC Turner (1-4) this week. Oswego junior Jace Wilson is off to a great start under the direction of new Indian coach Matt Fowler. After a standout season as a return man last season, Wilson has produced in the backfield in rushing for 876 yards and 15 touchdowns in the Indians’ first five games. That works out to 175 yards and three scores per game. Wilson rushed for 278 yards and six touchdowns in last week’s 48-44 win over West Elk. He also added a 29-yard touchdown catch to give him a seven-touchdown performance against the Patriots. Coach Fowler is trying to build the Oswego program in the similar manner in which he turned Spearville into a consistent eight-man contender. Oswego is 4-1 this season after winning just five total games in the past three seasons combined. After last week’s thriller over West Elk, the Indians have a challenging couple of weeks in home games with Central Burden and Cedar Vale-Dexter. Phillipsburg kicker Jon Hunnacutt, is closing in on the state record for career kicking points. Hunnacutt currently has 202 career points; just 12 points shy of the state record of 214 set by Olathe North’s Joe Garcia. On Friday, Hunnacutt drilled a 52-yard field goal before halftime to give the Panthers a 38-0 lead. Phillipsburg went on to beat Thomas More Prep, 45-0. Hunnacutt’s long field goal set a school and Mid-Continent League record. Phillipsburg is the top-ranked team in Class 2A and Hunnacutt give the Panthers another weapon in a close game.